she can quilt: Sunset - Ta Da! Sunset is finished. After trimming and washing, she is 42" wide by 41" tall. I used a bunch of Kona solids with Kona Charcoal for the background and binding. I have a lot of photographs of this quilt, but none of them actually show her off that well. The reds and oranges tend to turn into saturated burning blobs and the threads disappear. Like a sunset I guess. For the matchstick quilting, I used a lot of different threads, including Aurifil, King Tut by Superior Threads, Sulky, and Valdani. They are 40wt and 50wt. The picture above is the back after washing. The orange strip is a Katie Jump Rope print by Denyse Schmidt. I varied the thread colours randomly, with no advance plan, as I felt like it. This back photo is before washing, the only photo here that is. You can see that the washing added some more texture but it is not a dramatic change. The real change from washing is in the drape of the quilt. Even though I pre-washed all the fabrics, the quilt gets fairly stiff from the matchstick quilting. After the wash, it feels and moves almost like any other quilt, a significant improvement in the drape. You can see the matchstick quilting better in the close up photos. I worked to make the lines unevenly spaced and added some greater spaces from time to time. I use a fairly long stitch length, it is 4 on my Horizon. To keep the lines from tipping over or becoming too wobbly, I used a hera marker and marked a line about every 2". I started quilting in the middle and just worked to the edge. I encountered some pulling when I returned to the middle and changed directions, you can read about it here. Some folks have suggested first quilting lines spaced 1" or 2" apart over the whole quilt and then returning to fill it in. I think I might try that next time as it will also provide markings that are easier to see than the hera marker. Other people suggested quilting down a line, taking the quilt and turning it and quilting up next the line. While that is how I quilt small items, and I expect it is a method that will seriously reduce any pulling on the fabrics and piecing, given the time and effort to matchstick quilt this, all that extra turning of a quilt even this size is not for me. I did find that it also helps to lessen the pressure on the presser foot and to remember to hold the fabric in place as I went, especially at the beginning of a line, to reduce any stretching. A bunch of the photo attempts were on a windy day. I love this action shot, although it is hard to see the details. You can also see a little of how my house is decorated outside for the holidays. It is hard to decorate evergreens that are over 50 feet high and take up the entire frontage of the house. And here is probably the best photo I have. I adore Sunset. All she needs is a hanging sleeve, and she is going on the wall. By the way, my back has improved dramatically, and should be all better soon. And I am mostly on holidays after today, so there will be more blogging and sewing for me, in between cooking, and visiting and relaxing. Finally, don't forget that Q4 of the Finish-A-Long is drawing to a close. I, for one, will be working on my finishes in the week after Christmas to get them done before the end of the quarter, maybe you will be too. I will share more on the schedule for year's end this weekend. I am going to show off Sunset around the internet, and there will be other lovelies to visit at each link - Fabric Tuesday, TGIFF, Finish it up Friday. Absolutely gorgeous - another "well done" to you!!! oh I just adore what you have done here. Seriously, I like it SO much! Thanks for sharing all about it and LOTS of photos! I love the action shot too! I absolutely love it and love how the quilting makes the fabric change. Great vision in your work! I love the effect of the quilting there, especially the bands of colour created by the changes in thread. It's absolutely beautiful, Leanne! I love it! Amazing sunset and best of all is that you love it. Enjoy having it hanging where you can love it every day! I'm speechless Leanne - you have created a beautiful work of art. I don't know what to say! She's such a beaut and a real labor of love! You've done a remarkable job on this quilt Leanne and it is a quintessential contemporary piece. I know that you'll enjoy looking at Sunset on the wall every day for years to come!! REALLY spectacular! All the teaser shots you gave of this made me think it was a 'mini'. I'm surprised to see how large it is. Kudos to you for a wonderful finish! Ta da indeed. Just fab. You should totally show this quilt. What a fun quilt to look at! Lots of texture--I bet it's so much better in person! Fab.U.Lush :-) I love 'matchstick quilting' but it kills my shoulders every time, so Well Done You!!! I do believe that Sunset is worth every stitching line. Lovely. Take care and enjoy your holiday! A masterpiece! Your color instincts are perfect. What a stunning work of art. love it. the colors, the quilting, the design. I also adore her. Thanks for letting us watch. Enjoy your holidays and happy stitching. gorgeous gorgeous gorgeous! Love the matchstick quilting - the texture is fabulous, and love the bands of colour from the thread changes. Enjoy the holidays now! I love her. She is wonderful and the bits of blue thread were inspired. She deserves to be showed off all over the place. Love all the colours in her background, and glad your back is better too! SIMPLY DIVINE! I cannot wait to try match stick quilting. :) I have thoroughly enjoyed watching your efforts come to completion. I can't wait to see what you tackle next! Merry Christmas Leanne! Really like this, I love the way the different colour quilting shows in bands across the quilt. I think the tree-and-ornament shot shows her off the best. Turned out wonderful! Wow Leanne, it is absolutely stunning! This is amazing! Merry Christmas. Beautiful quilt, and your matchstick quilting is something I am putting on my to-do list for next year! This is one of my favorite quilts ever, easily. Mad props. Absolutely stunning - love all of that amazing dense quilting! I think this is my favourite ever quilt. Absolutely beautiful. This just inspires me to do some match stick quilting. It is really beautiful. Lovely pics. Just gorgeous and thank you for sharing your process the past while. Ooh, it's beautiful, Leanne! The matchstick quilting turned out great and I love the colour changes in thread. I'll have to give that a try sometime. Love it! It's a really pretty finish, Leanne. And your photos are just great, especially the action shot of you holding the quilt. Beautiful! Leanne, it turned out just beautiful. I'm sure this is one of those quilts that looks better in person, but the photos are pretty good. The close ups help give a good idea of the variation of colors. I bet you are thrilled to have this one to hang up. Congrats on a wonderful finish. Amazing I just love your matchstick quilting - I cannot imagine all the time that goes into such a gorgeous piece of art. Stunning Leanne. The different colour threads and the variegated threads look positively awesome. Beautiful. I love the texture and the way the strips of colourful quilting change the colour of the circles a bit. I love the action shot too - the quilt looks so cool flying like that and you've got such beautiful trees there. Lovely! The quilting really changes the color and texture of the entire piece! I love that you used the solid Charcoal for the binding too...sets the tone. fabulous job! An absolutely gorgeous quilt! Shapes, colors, quilting, a masterpiece. Matchstick quilting may just be the thing for a quilt of mine, for which I could not come up with an appropriate quilting idea so far. Thanks a lot for sharing those detailed pictures. Every time you show this quilt I love it more - it is absolutely stunning - one of the best out there!!! WOW, WOW, WOW! a spectacular quilt, it's so good to see it finished. It really is incredible, well done! Words don’t do this quilt justice. It’s beyond beautiful, stunning and spectacular! Love the picture in the snow! Really gorgeous! And thanks for walking us through your process. What a beautifully, luminous quilt. It is wonderful that you share your process. There will be one in my future. Thank you and a very Merry Christmas to you from the warm Texas Gulf Coast! The sunset is so beautiful! I really adore this one. It turned out absolutely beautiful, Leanne.....the artist in you is really evident in this amazing piece of art!!!! So glad to hear your back has improved. At first glance I though you had used stripe fabrics in the background even though I knew you hadn't. The quilting is just fabulous. Can't even begin to imagine doing all that quilting back and forth over and over. Beautiful. Lovely! The quilting just makes it. I admire your patience for the matchstick quilting. I don't think I have it in me. Without a shadow of a doubt the most beautiful sunset ever ! Wow. It really turned out fantastic and I know that you will enjoy looking at it each day. Wonderful quilt! You are so patient with quilting! It looks amazing, really inspirational. The most beautiful and innovative quilt I've seen in some time. I can just look and look at it and never tire of the quilting, the color and the way the light dances across it. Just amazing! 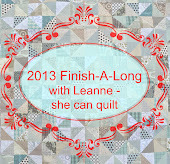 I love this quilt Leanne, matchstick quilting is awesome! AMAZING! Love the colour, love the stitching, love the design. You are one creative gal! Saw this in Chattanooga in September. It is beautiful! My husband was fascinated by the multi-color quilting. And as you said, photos don't do it justice.